He grew up on the East Coast as one of nine siblings and fell in love with Coronado while on a summer cruise as part of Naval Reserve Officers Training Corps at Duke University. After graduating from Duke in 1985 with a Mechanical Engineering degree, he was commissioned as a naval officer in the Surface Navy-Nuclear community. Fast forward 25 years and Henry has completed numerous assignments including two years on exchange with the Royal Navy, command of the amphibious warship, USS Germantown, and Reactor Officer of USS Ronald Reagan. He has also completed an engineering-based Master of Business Administration from Southern Methodist University and achieved certification as a professional engineer in California. Henry retired from the Navy as a Captain and started his second career as the Executive Director of Higgs Fletcher & Mack, San Diego’s oldest full-service law firm. Utilizing his extensive leadership and management skills, he assisted the Managing Partner with modernizing and growing the firm from 58 to 78 attorneys while expertly building and managing a multi-million-dollar budget. Henry departed the firm in 2017 and started his current company offering strategic business and operations consulting services. Moving to the Cays in 1997, Henry lives in Port Royale Village with his wife, Lesley. They have three grown children and enjoy the beauty and serenity of the Cays. His hobbies include backpacking, hiking, scuba diving, and craft beers (#249 in the Island Beer Club). 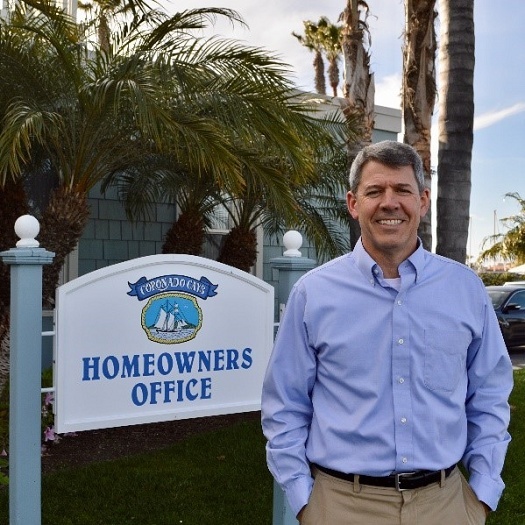 Henry has been active in the local legal community and has volunteered his time on the Board and Finance Committee of the Coronado Schools Foundation for the past 10 years. Welcome Henry to the CCHOA and best wishes as the new General Manager!